Former Brexit Secretary Dominic Raab speaks to talkRADIO's Julia Hartley-Brewer from College Green in Westminster. MPs are set to vote on Theresa May’s Brexit proposals on Tuesday evening. 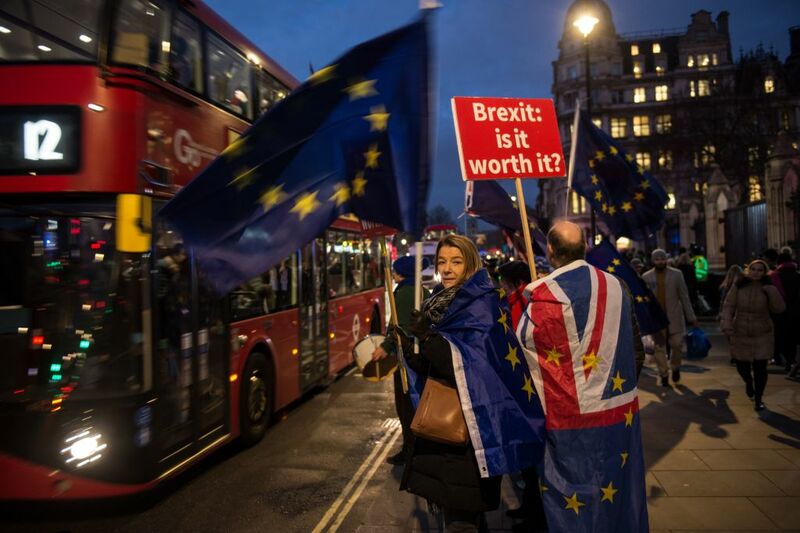 The MP for Esher and Walton told talkRADIO’s Julia Hartley-Brewer: “I think the scale of the defeat will affect what the Prime Minister chooses to do next. “I am not going to get into the fool’s errand of trying to predict precisely what that would be but I think what MPs should do is look at this deal. “In my view it is a bad deal because of the £39bn your listeners are handing over. We don’t get a free trade deal with the EU. “We don’t get control over our laws, our borders and our trade policy. I think we should just play this very straight. Anti-Brexit protesters in London as MPs prepare to vote on Theresa May's Brexit proposals. Mr Raab added that preparations for a no-deal Brexit needed to be “accelerated and intensified”. “The EU are notorious for playing hard-ball and going right up to the wire,” he said. “I think we should continue to keep the arm of friendship open Keep talking to them, and keep trying to remedy a bad deal. “I think we will leave the EU at the end of March and I think the preparations for leaving on WTO rules need to accelerated and intensified.